We have great news for you: ‘R-Economy’ has been included into the list of journals approved by the Higher Attestation Commission (VAK). ‘R-Economy’ (ISSN 2412-0731) is a peer-reviewed electronic journal published in English. 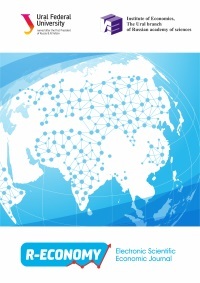 The journal observes both fundamental and practical results of the surveys in the spheres of regional development and economic space, state regulation and financial security, regional and municipal budgets, intersectorial regional complexes, as well as a number of other theoretical and practical questions of regional economies. ‘R-Economy’ aims to publish high quality research in regional economics with a special focus on how regions, and especially Russian regions, relate to and function within international socio-economic processes. We emphatically invite economists who write from and on BRICS countries. ‘R’ in the title refers to its three major foci – Region (regional development), Rating (comparative research) and Regulation (state policy). equalization policy in socio-economic regional development. The founders of ‘R-Economy’ are active members of the following communities throughout which the journal is distributed: RSA (Regional Studies Association), EACES (European Association for Comparative Economic Studies), HSE (The National Research University Higher School of Economics), NES (New Economic School), ARETT (Association of Russian Economic Think Tanks), and AC Expert. The journal also collaborates with international academic partners of the Graduate School of Economics and Management (Ural Federal University).